Every single member of the human race is an integral part of our world. (Yes, even you!) Each individual contributes greatly to the state of our existence. Imagine what we could accomplish if every single person achieved their goals! 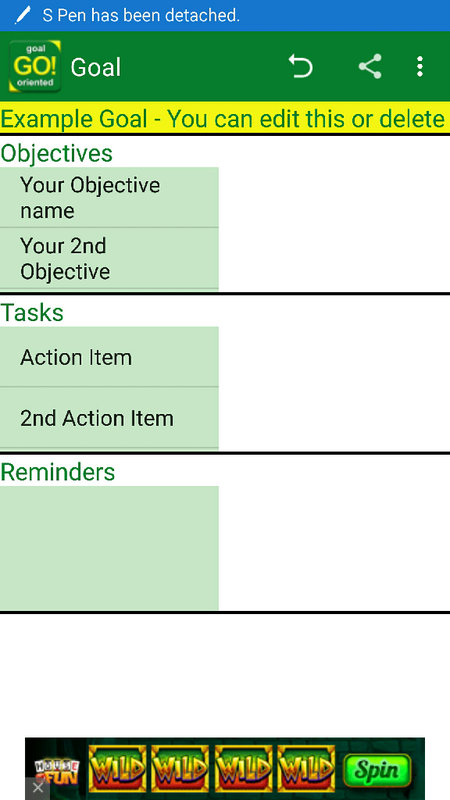 This software will make goal planning easier and motivates you to get things done. Everyone has goals, whether they realize it or not. They may be extravagant, lifelong dreams, or even just as simple as getting to work on time. Driven, goal oriented people are able to accomplish their goals through internal motivation which allows them to be focused and headstrong during their journey to success. The rest of us struggle with what to do next, worry about failure, and remain static as others pass us by. Our app is intended for every individual, from CEO's to the common man, in order to help them organize their goals and take the steps needed to be successful in whatever they desire. As a Goal Oriented individual, you will be able to create multiple goals in several different categories, create and edit the steps needed to reach those goals. You can even share your goals with your friends for motivation, and brag when you've accomplished a task! Let's work together to make your dreams a reality. You are on your way to becoming Goal Oriented! Goal Oriented is in design and prototyping and is planned for a 2016 release for iPhone, Android, and Windows Phone. Please contact us with app suggestions -or- for beta testing involvement.